DreamTV Studios Film Productions has worked with numerous young actors/actresses over the years, as well as auditioned a few. We wanted to name a few actors/actresses to watch out for. We have watched these young stars go on to big hollywood films, major film festivals, and win impressive awards. 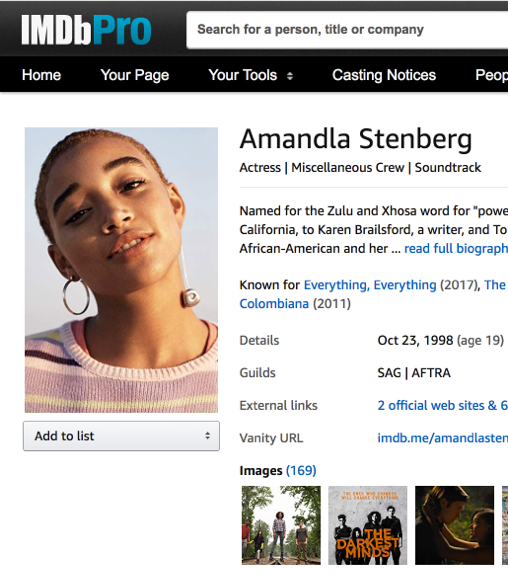 Although we have titled this list Top Indie Child/Teen Actors and Actresses in Houston, Texas, we want you all know that Indie doesn't limit talent it just broadens skills. We are the company that's very selective of our young stars. We only cast the best and we assure you this list is the best of the best. Dalton was born in Houston Texas and shortly moved Katy, Texas. His dad is a sheriff deputy and his mom started her own aviation business to be able to travel with Dalton to all his auditions and acting jobs. He has an older sister Katie. At age 13, Dalton was asked to do print work, didn't do it because he wanted to focus on his motocross career. Shortly after, Dalton broke his collarbone and, unable to ride his dirt-bike for a few weeks, he contacted an agent and they setup an audition for a feature film I Lack. He landed his first acting job and that was the start of Dalton's love for acting. Dalton is known for playing Master Mike in season four of American Horror Story, Jack Colson the son of Terry Colson (David Morse) in HBO's Treme, playing a Young Harry (Jeff Daniels) in Dumb and Dumber To. When Dalton is not working, he loves riding motocross, BMX, video games, and hanging out with friends. Sadie Brook is a Texas based actress who began her career at the age of three when she booked her first modeling job. Growing up in the business she realized there is nothing she would rather do. She plans to continue acting as her full time career. She has appeared in feature films, short films, commercials and print. She won her first acting award in 2012 when she won Best child actress in a film completion put on in Houston, TX. She has always loved to dance and started dance class at the age of three then later moved on to cheer leading. She is currently a varsity cheerleader at her high school. Sadie is the oldest of three siblings she has two little brothers Brody and Carter who sometimes follow in her footsteps and do some acting of their own. Sadie has a cocker spaniel she adores and also loves fashion and art. Stevonte Hart is an actor, known for Li'l Mayne and the Knuckleheads (2019), Dolly Parton's Heartstrings (2019) and Blood and Water (2016). Audrey Scott made her screen debut at the age of 7 playing the younger version of Diane Lane in Disney's Secretariat then quickly moved to the ABC Family movie Revenge of the Bridesmaids. Her first leading role came at the age of 8 when she was cast in the independent film About Sunny (known as Think of Me during it's festival run) where she played "Sunny" opposite Lauren Ambrose. Following the film's premiere at the Toronto Film Festival, Audrey received several favorable critical reviews for her work including being lauded for her "quietly natural thesping" by Variety. For an actor of 11, she has had the opportunity to work alongside some of the most talented actors, writers and directors in the film and television industry. In 2011 she starred alongside Academy Award winner Ernest Borgnine, Academy Award nominee June Squibb and Independent Spirit Award nominee Dale Dickey in the independent film The Man Who Shook the Hand of Vicente Fernandez. The L.A. Times praised her performance and noted "the unsentimental chemistry between them (Scott and Borgnine) is the strongest element of the film". Audrey also appeared opposite Jean-Claude Van Damme in Universal Soldier: Day of Reckoning, which was recognized by Indiewire as one of their top ten films of 2012. She also had the opportunity to play the younger version of Amy Poehler in NBC's Parks & Recreation that same year. Most recently, Audrey played the role of "Young Karen" (series regular) in the 2014 FOX pilot Fatrick, written by Nahnatchka Khan and Corey Nickerson and directed by the Academy Award winning duo Nat Faxon and Jim Rash (The Descendants). She will appear next as "Edie" in the independent film Goodbye to All That written and directed by Angus MacLachlan. The film will premiere at the Tribeca Film Festival in 2014. Born in Spartanburg, South Carolina and an only child, Audrey lives with her parents and her mini-schnauzer, Porter, in Houston, Texas. When not acting, this 6th grade honors student studies guitar, sketches, and designs and makes jewelry. She is an avid reader and considers herself a "professional fangirl" of Greek mythology, superhero comics and dystopian fiction novels. Deke started acting at the age of 7, when writer director John Hale put him in his debut film ( Hyphen ). Since then he has been cast in around 14 different short films and 3 features. He has worked in every genre of film you can think of horror, comedy, drama, and children's. He has also done some TV and industrial videos. When not acting Deke goes to school where he is an all a honor roll student and helper to special needs students. He also loves skateboarding, if not working on a film or doing school work he is skating. Sawyer Bell is a child actor best-known for his role as Young Stefan in The Vampire Diaries. Sawyer made his national television debut in September 2014 in Deliverance Creek, a backdoor pilot for Lifetime and Nicholas Sparks' first made-for-television production. Sawyer played Abner Barlow, son of the story's heroine Belle Barlow (Emmy-nominated Lauren Ambrose). Sawyer recently wrapped filming for The Last Possession, a supernatural feature film which follows a family who has moved into the house of their late patriarch (Tom Proctor - Guardians of the Galaxy, Nashville). Sawyer's character, Jack Peroni, knows "there's no such thing as monsters," but begins to question, worry and experience extraordinary things as the events of the thriller unfold. Sawyer can also be seen in the upcoming feature Daylight's End (2015) as Max, one of the main survivors in the apocalyptic action film starring Lance Henriksen (Alien) and Hakeem Kae-Kazeem (24, Black Sails). Sawyer first discovered his passion for performing in kindergarten while playing Ian in Little Miss Olivia on stage. Soon after, he began singing and dancing in musical theatre roles. At age 7, Sawyer gave an award-winning performance as Gavroche in Les Miserables, and went on to deliver compelling portrayals of Young Tarzan in Tarzan; Ugly, the lead role in Honk; Tiny Tim in Scrooge and many others. When the North Texas native is not acting, he enjoys making music, singing and playing guitar, hanging out with his friends, and mastering the latest video game. Landon Brooks was born on January 8, 2000. He is an actor and director, known for Trapped: In Me (2011), The Asphalt Race (2014) and My Heart Dies with You: Hearts Journey. Landon Brooks was born on January 8, 2000. He is an actor and director, known for The Asphalt Race (2014), One More Day (2010) and Daddy's Girl (2012). Catherine Ribbeck is an actress, known for Trafficked (2017) and Imagination (2010). Hailey Riggenbach was born in Houston, TX. Her passions are dancing, acting, modeling, writing and art. Raya Wright is an actress, known for Sleepy Hollow (2013), Criminal Minds: Suspect Behavior (2011) and Men, Women & Children (2014).